Kauto Star winning his 4th King George Chase was incredible. Won by a huge distance making a sorry messy of the field. One by one they seemed to drop off. 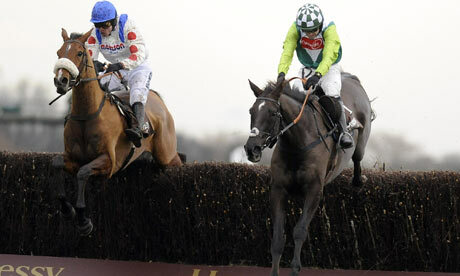 The match race against Denman at the Cheltenham festival will be a cracker. Watched it on Youtube. 36 lengths is no mean feat. Great to hear the crowd cheering for him. He is really something else!! Also, interesting to see there were no falls. Two pulled up but stuffed I think, not injured. Says a lot for giving horses a fence to jump instead of the toothbrushes we have. Now that Sky are showing a lot of the top UK jumps racing, you can see not only what a top spectacle they are, but there are very few falls at teh top level. Decent fences with horses showing proper respect for them. Sky should impose the same influence on UK racing that they have on Aussie racing so the big races can be run earlier in the night. The trouble with the jumps season is twofold. Daylight saving at both ends (stopped there started in some states here) makes the races later by our time. Not sure what happened in that first race at Southwell, SKY lost vision of their replay about the 200 when Look Officer was home and hosed and was indeed matched as low as 1.02 on betfair. Comparisons to the mid-1960s golden era of jumps racing when stablemates Arkle and Flyingbolt towered above their rivals have never seemed more relevant after confirmation that Denman had matched Kauto Star by being pushed up to a career-high mark by Timeform. Meanwhile, the mouth-watering prospect of the two horses clashing in the Cheltenham Gold Cup in March with the two outstanding jockeys of the current generation on board was also underlined as one bookmaker made Tony McCoy 1-3 favourite to ride Denman against Kauto Star and Ruby Walsh. Unlike Kauto Star, who sprinted clear to take the King George VI Chase by 36 lengths at Kempton on Boxing Day, Denman's higher rating has been achieved without him having to leave his box at Paul Nicholls's yard. Instead it was the victory in Tuesday's Lexus Chase at Leopardstown by What A Friend, the horse who was unable to live with Denman in the final stages of Newbury's Hennessy Cognac Gold Cup last month despite being in receipt of 22lb, that has seen Denman raised 2lb by Timeform to a new rating of 183, 8lb behind Kauto Star's 191. His official British Horseracing Authority rating is likely to be adjusted by a similar amount or more. "What A Friend has gone up from 154 to 156 as a result of his Lexus Chase win, so we have taken a fairly conservative view about the strength of that form, but there is no doubt that Denman deserves to have his rating for his Hennessy victory raised and both he and Kauto Star have never been rated as highly as they are now," said Timeform spokesman Kieran Packman. "The only other comparable period in the last 50 years of jumps racing was when Moscow Flyer (184) beat Azertyuiop (182) and Well Chief (182) in the Tingle Creek Chase in 2004." Paddy Power started betting on who will ride Denman in this year's Gold Cup, making reigning champion McCoy the 1-3 favourite to get the mount. Sam Thomas, who rode Denman to finish second to Kauto Star in last season's race, is a 5-1 chance. However, rather than attempt to dominate the Gold Cup in numbers for the second year running, Nicholls, who sent out first, second, fourth and fifth in the race last year, has confirmed that he will resist the temptation to run What A Friend in a bid to repeat his 1-2-3 in 2008. "He's had two runs now and he'll probably melt a little bit, so my inclination is to leave him fresh and go to Aintree and Punchestown," said Nicholls. "He'll have a Gold Cup entry, just in case anything happens, but if Denman and Kauto ran I suspect I'll have a chat with Ged [Mason] and Sir Alex [Ferguson] and we'll aim for Aintree. He doesn't enjoy it when the ground is that soft. He'll be much better in the spring on some better ground." A gambler has been given a suspended jail term after he threatened to kill dual Breeders' Cup Turf winner Conduit unless he was withdrawn from a race. Andrew Rodgerson, 26, warned Ballymacoll Stud's stud manager Peter Reynolds not to run the colt in the King George after he forgot to place an accumulator bet on behalf of a syndicate. He panicked when he realised that victory for Conduit would lead to the syndicate expecting winnings of Â£50,000, Bolton Crown Court heard. Rodgerson, of Balderstone, near Rochdale, sent a series of text messages and emails to Reynolds. Ten days before the race he texted Mr Reynolds: "Dear Peter, we would just like to warn you should Conduit run in the King George then the horse will be killed." Five days later he followed up with an email, which read: "Dear Peter, I don't believe you are taking the threat of death to Conduit very seriously. We want the horse removed from the King George this weekend. If you co-operate the horse will live. "There are people living in and around Newmarket who are ready and willing. There will also be people around at Ascot on Saturday." Police in the Newmarket area were informed and Rodgerson was arrested at his home address just two days before the King George. He admitted making the threats. Rodgerson pleaded guilty to threatening to commit damage at an earlier hearing after an initial charge of blackmail was dropped. Sentencing him to 34 weeks in jail, suspended for two years, Judge Angela Nield said he had embarked on a "foolish escapade". She accepted his actions had no practical consequences in that Conduit lined up for the King George and actually went on to claim victory, but she said a message of deterrence had to go out. "If offences such as this are not dealt with seriously than the (horseracing) industry will be undermined and those who work in it risk their livelihood being damaged and the manner in which they operate being altered for good," she said. Bright lad, that. Do remember to always place your accumulator bets. Record number of meetings getting cancelled or postponed due to the weather all over Great Britain. Some of the critics of all-weather tracks biting their lips as luckily these meetings haven't been affected, in fact some extra meetings been added to fill the 'gap'. Obviously effected by gloabl warming. If anybody is interested I like Lady Darshaan and Blue Maiden in the 1000 Guineas. It does not matter where racing is held the biggest blight is always JOCKEYS, The relevant authorities need to invest large sums of money to find alternatives to jockeys. Why any jockey would pick to go the far side on that course is beyond me. The relevant authorities need to invest large sums of money to find alternatives to jockeys. That race made any Flemington bias look miniscule. The far side (including an equal favorite) finished probably 7+ lengths from the stand side. Regarding the result, the protest upheld was the right decision. EVEN though his runner Awzaan finished unplaced, Sheikh Hamdan al-Maktoum still secured a 2,000 Guineas victory as the breeder of shock winner Makfi, a Classic winner for Darley sire Dubawi from his first crop. Indeed, Makfi was in training for Sheikh Hamdan last season with Marcus Tregoning before being sold for just 26,000gns at last year's Tattersalls Autumn Horses-in-Training sale. Between them, the first four home in the Guineas cost less than £120,000 to purchase as a yearling or juvenile. Makfi was bought by Hubert Barbe, who has sold a series of high-profile jumpers to the UK such as Banjo, Escartefigue, Hors La Loi III, and Valiramix, with Martin Pipe and David Johnson among his main clients. He has also bought notable Flat horses such as the stayers Geordieland and Cashelgar. Despite his astonishingly lowly purchase price, Makfi is by Dubawi, who made a hugely promising start with this first two-year-old runners last season, and comes from a highly desirable distaff line. His dam, the unraced Green Desert mare Dhelaal, is a half-sister to Sheikh Hamdan's champion two-year-old Alhaarth and to the dam of his Derby third Aqaleem. Further back this is also the family of Derby winner Authorized. The UKs biggest and brashest punter (and owner of denman) Harry Findlay suggested he was going to have a big go on Big Buck's today.......dunno what a big go is for him, but he did admit to losing £2.5m on the all blacks in the last world cup!!!! Harry has had a bio released. Strikes me as one more bad gambler. Talented but with serious maths flaws.